NAAWAN, MISAMIS ORIENTAL, PHILIPPINES -- So, Iligan Bay is also along the whale sharks' migration path. This was confirmed last week as a 15-meter whale shark, Rhincodon typus, was trapped in a fishpen of Eduardo Gaid, 59 on Feb. 4, 1999 dawn and released unharmed by noon in Barangay Maputi, here, about 60 kilometers from Cagayan de Oro and 28 kilometers away from Iligan City. A team of four marine biology professors, three scuba divers from Iligan City and about 10 fishers aided the huge fish out of the fishpen Thursday noon amid an audience of about 100 boat-riding spectators. It took only about 35 minutes to guide the fish out, said Naawan Mayor Erlinda Niere, who supervised the rescue operations and informed government agencies about the whale sharks. The team dived at 11:45 a.m., took underwater photographs and video, and guided the fish towards the pen's entrance. The fish glided back to the open sea at 12:15 p.m., Niere recalled. "I would say it was very graceful," said marine biologist Prof. Renoir Abeira of the Mindanao State University School of Marine Fisheries here who was among the team who released the shark. "It never showed signs of agitation. I was swimming in front of it, orienting it towards the pen's opening, and it's mouth was so huge it could swallow me whole and still have room for another. If we are to assign a human feeling to it, I would say it looked shy," he added. The fishpen was about 500 meters from the village's sandy beach front which was about five to six fathoms and had an area of 20 by 25 meters. A 9.5-meter whale shark trapped in the same fishpen on the night of Feb. 2 was not lucky. It had at least 17 stab and hack wounds and died 24 hours later. Three of the wounds on its head were round, apparently caused by a spear or harpoon. It also had a one-foot hack wound on its first dorsal fin. As early as the first hours of Feb. 3, fixers were bidding on the shark's seven fins. Some of the speculators, the fishers said, were willing to give earnest money. The bid was as low as P500 per kilo to P3, 600. In the international market, shark's fin would cost $564 per kilo, according to the International Union for the Conservation of Nature (IUCN). About 40 fishers brought the huge fish out of the fishpen and towed it close to shore by tying two ropes around its caudal fin and around its belly. The ropes were tied to a talisay tree on the shore. Children took a ride on its back which was big enough to carry at most 15 kids. Enterprising boatmen charged P5 per person for a trip closer to the knee-deep waters where the shark was beached. Hundreds of sightseers, some coming all the way from nearby towns of Iligan and Cagayan de Oro cities streamed into Barangay Maputi's beach to take a look at the world's biggest fish. "I have touched the inside of its mouth. There are a hundred marbles inside it," remarked Jorge Ty, 12, one of the kids who spent the whole afternoon of Thursday swimming close to the dead fish. "It moaned like a cow all night," said a fisher. "And that night, the other sharks were trying to get near. They went wild," said another. "They swam from one end of the shore to another." The fish was already in its death throes when government officials from Cagayan de Oro, including Department of Tourism Regional Director Dorothy Pabayo and Elvie Lomingkit of the Bureau of Fisheries-10, arrived on Feb. 3 afternoon and ordered the release of the wounded fish. There were conflicting reports about its wounds. On Feb. 3, fishers reported that the fishpen owner and some other fishers inflicted the wounds the night the fish entered the corral. Gaid and his son-in-law, however, denied the allegations. "I thought only dolphins, whales and sea turtles are banned," Gaid explained, as he urged the Bantay Dagat and other agencies to hold a massive information campaign on these whale sharks. Gaid was also mourning more over his damaged fishpen than the dead shark. He was not even concerned about the possibility of facing prosecution for not releasing the creature the night it got caught. "Who will help me repair my fishpen? I thought all the while that any fish that gets into it should be ours. Now, we can't even get a piece of that fish," Gaid said. He cannot understand why the law prohibits the use of the dead shark. He said damage to his pen costs about P6,000 to P8,000. "We will assist him and the other fishpen owner," promised Mayor Niere as she also said that no one would be investigated or prosecuted for wounding the animal. "I was told it was already wounded and very weak when it came into the pen." A third whale shark was released by the owner of a fishpen adjacent to Gaid's. It belonged to the same school of about seven sighted since Feb. 2. "The one that went inside my pen was much bigger," said Ruel Tipolo, 38. "It tried to ram into the net and tore it. But I dived and guided it out. Its huge eyes looked directly at me, blinking several times," he said. It appeared that the huge fish were attracted by the light from the petrol lamps. "I turned off the light to keep them out. I could still see them roaming in the waters," Tipolo added. It was the first time in this decade that a whale shark was landed in Naawan but Gaid said that he knows they ply these waters since he was young. The Naawan whale shark sightings came barely two weeks after the Regional Ecotourism Council launched the Walk for the Whale Shark on Jan. 16. It was aimed to raise funds for a whale shark museum, an alternative livelihood program for traditional whale shark hunters now turned spotters and guides. 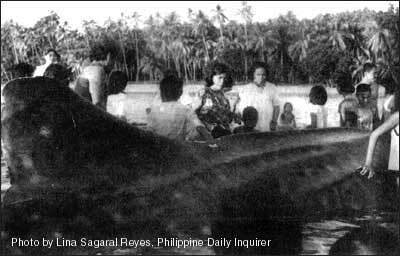 Whale shark hunting used to be a tradition among a group of fishers in Talisayan town along Gingoog Bay also in this province until the 1998 ban. The huge creatures had also been sighted and hunted in Camiguin Island. 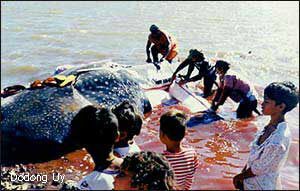 Whale shark in Talisayan, Misamis Oriental, before the ban. Fisheries Administrative Order 193, series of 1998 bans the taking, catching, selling, purchasing, possession, transporting, and exporting of the whale sharks. The order also applies to manta rays. Offenders are fined not less than P500 to more than P5, 000 or six to four years' imprisonment, or both, depending on the discretion of the court. Published February 12, 1999. 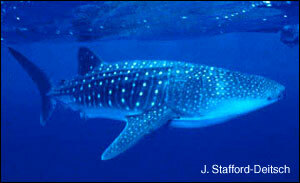 See the Shark Research Institute for questions and answers about whale sharks.